Mimsy: Carl DeMaio for San Diego Mayor? Carl DeMaio for San Diego Mayor? At the San Diego Tea Party’s December meeting tonight, City Councilman Carl DeMaio reminded us that today’s pension crisis was only really a surprise to the establishment; the math was obvious. When we started talking about the pension crisis, as a government watchdog when I started shining a light on the city of San Diego’s financial problems, what did the special interests, lobbyists, and the labor unions say? And the politicians, and a Republican mayor? What did they say in 2003? We know all too painfully what the record has been. Those pensions have run up a debt that we now have to grapple with. They’ve resulted in cuts in our services in every neighborhood. We’ve seen our roads now fall apart, and our roads are now worse than the East coast roads where they have snow and sleet. 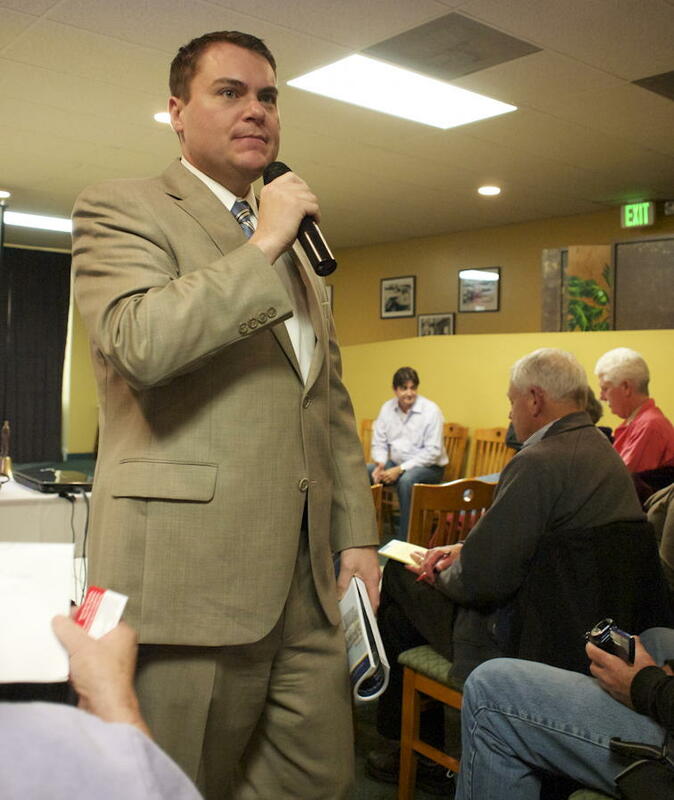 This is clearly not a new crusade for DeMaio. In 2006, he “helped craft and sponsor” Propositions B and C, giving voters final say on pension benefit increases, and requiring competitive bidding for city functions. In 2010 he led the fight to defeat the proposed San Diego tax increase—an increase that was supported, with time and money, by other San Diego politicians including most of the city council1 and mayor Jerry Sanders, and the government unions, to the tune of half a million dollars, outspending the “no” campaign by over 50%. He’s a major reason San Diego is now on the road to a defined contribution plan instead of the defined benefits plan that is bankrupting cities across the nation. He has a history of winning tough fights against the establishment. On June 3, 2008 Carl DeMaio was elected to the San Diego City Council to represent District 5. Carl made history as a non-incumbent taking a Council seat by the widest margin in a primary-winning 66% of the vote. He’s also running, in one sense at least, a very unconventional campaign. The centerpiece of his campaign is “A Roadmap to Recovery”. It’s nearly 90 pages of specific reforms that put San Diego back in the black and, among other things, fixes the roads. I was originally going to say that he’s the Chris Christie of San Diego, but he’s not. He’s our Paul Ryan—but one of the reasons Paul Ryan isn’t running for president is that by conventional wisdom, putting out a specific plan opens you up to specific criticism. It means that all of the special interests that will be hurt by that plan will fund your opponents. We’re not going to come in and punish. We’re going to give you something that you never gave the taxpayers in all the years of negotiations. We’re going to give you a fair deal… [and] under my labor contracts, the promises I make, I will be able to keep them, because I can afford them. And you will work for a financially stable city government, and not one on the verge of bankruptcy. That really ought to count for something. I haven’t yet read the roadmap—I just got back from the meetup. I have downloaded it and loaded it on my iPad. As soon as I’m done with Throw Them All Out I’ll be starting A Roadmap to Recovery. There are eight members of the San Diego City Council; six are Democrats and two Republicans. The six Democrats voted for the tax increase; the two Republicans, Carl DeMaio and Kevin Faulconer, voted against it. So far, this has been a fascinating and frightening work. Peter Schweizer details not just the insider deals that congress engages in, but how they can get away with it—by making sure that the laws they create don’t apply to them. Is Nathan Fletcher desperate for another political job before his current term runs out? Carl DeMaio for San Diego Mayor? last modified December 15th, 2011.